Ed Miliband has accused David Cameron of "broken promises" on the English NHS, saying a pledge of above-inflation rises in funding will not be met. 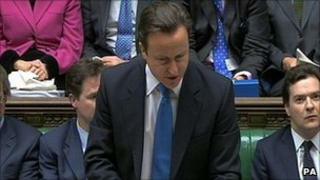 He also attacked plans, confirmed by the coalition on Wednesday, to abolish primary care trusts. But the prime minister said he was "confident" the health budget would grow every year until at least 2015 and that services would be better run. The English NHS has been told to make up to £20bn in efficiency savings. Health Secretary Andrew Lansley has also confirmed that the government will push ahead with structural changes, including abolishing primary care trusts (PCTs) in England by 2013, after which groups of GPs will plan hospital care and manage budgets. The coalition says this will improve efficiency and local accountability and reduce central control. But Labour argues that the restructuring will cost £3bn and, by removing a middle tier of management, give Whitehall more direct influence over community healthcare. At the final prime minister's questions of the year, Mr Miliband said to Mr Cameron: "Can you now confirm that you are set to break the promise made in the coalition agreement which said 'we will guarantee that health spending increases in real terms in each year of the Parliament'?" He cited a recent health select committee report which argued rising inflation levels would render the pledge impossible. Mr Cameron responded that the government had "increased the NHS budget by £10bn in this parliament" and that only the Conservatives had stood on an election platform of "saving the NHS and its spending". He added: "I am confident that we will fulfil our goal of real terms increases every year in the NHS." PCTs control 80% of the NHS budget and are responsible for providing services such as hospitals, dentists and opticians. All 151 in England will go, along with the next tier of organisation, the strategic health authorities - 10 of which operate at a regional level. "After six months is there an old truth being confirmed: when it comes to the NHS you can't trust the Tories?" Mr Cameron replied: "We are not reorganising the bureaucracy of the NHS; we are cutting and abolishing the bureaucracy of the NHS. "Because we are making a 45% saving in the bureaucracy of the NHS that is going to save £1.9bn. Because we are increasing the spending of the NHS that money will be going in to hospitals and beds and nurses and doctors. "All of those things would be cut if it was up to the party opposite because they don't have a commitment to maintaining NHS spending." Mr Miliband said the coalition had broken multiple pledges in recent months, including on the universality of child benefit and prison sentences for anyone found carrying a knife. But Mr Cameron said Labour was opposing individual spending decisions without coming up with "one single suggestion" as how to deal with the budget deficit. "He has got to look at the bigger picture. And the bigger picture is we inherited a completely wrecked set of public finances." The reforms doe not affect the NHS in Scotland, Wales and Northern Ireland, which are the responsibility of the devolved administrations.